“Celes, after 25 years of marriage, I find myself alongside someone from whom I’ve grown apart. I’ve lost all desire to be with this person and yet the thought of being without him scares me to pieces. I’m a successful businesswoman who is able to make some very high-powered decisions on the spot, but the one very important decision in my own life is the one I flounder with like a fish out of water. I just cannot seem to sort through this one. What do you do when faced with a big decision which you don’t know the answer to? 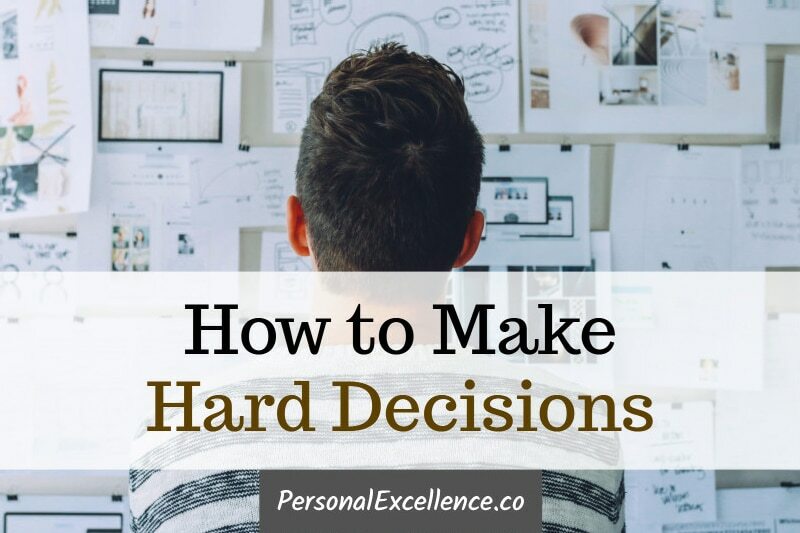 Today, I share my three best decision-making methods to break out of any dilemma. The first method is what I call the Fast Forward Method. Back in the VCR days, there is the fast-forward button where you can press and skip ahead to the later part of the video. It’s the same here, where you imagine that you are 1, 3, 5, or even 10 years into the future, to decide the option that is the best for you. How does this help? Firstly, it removes you from your present situation so that you can evaluate the decision objectively. When you are inside a decision, your judgment can get clouded and it prevents you from looking at it holistically. When you adopt a future view, you can assess it from a future-lens. What seems important now may be unimportant in the long run. Likewise, what seems unimportant now may actually be super important in the long run. Secondly, when you fast forward yourself on a path, the pros/cons of that path get magnified. You see the realities of each path and what’s going to happen next. It helps you assess if an option will bring you to where you want, rather than waste years of your life to find out. Consider a decision you are facing right now. It can be a small or big decision. It can be regarding your relationship, marriage, career, business, or other life areas. What options are you considering for this decision? Write them down. Imagine if you were to take Option A. What would your life be like a year from now? How about three years? Five years? 10 years? How about Option B? Fast forward yourself one, three, five, and 10 years into the future. And Option C? Repeat the projection for your remaining options. Which scenario do you want to be in? This is the option for you. One of my biggest decisions up till my mid-20s was whether to quit my job to pursue my passion. Contrary to what most may think, my dilemma was not between staying in my job and pursuing my passion. I already knew that I want to pursue my passion. My dilemma was between (a) quitting right away to pursue my passion, and (b) working for a couple more years before quitting, to get more savings. Option A would bring me fulfillment because I would get to pursue my passion right away. Option B would give me a bigger savings buffer. Initially, I couldn’t decide because both options had their pros and cons. Each seemed like a viable path. The answer hit me like a bullet: “Quit right away and pursue my passion.” There was not even a moment of doubt. It was so clear what I needed to do. Why? Because even if I were to pursue my passion and make little progress after 1-2 years, I would still make more progress than if I continued on in my day job. My day job wasn’t going to bring me closer to my dreams except give me more savings. I already had savings to last me for two years. To work an extra day in my job meant delaying my passion for another day, and subsequently delaying my dreams. In fact, the further I fast forwarded myself, the clearer my answer was. 10 years? The same answer as before! By fast-forwarding myself 1/3/5/10 years into the future, I could evaluate the situation with objectivity. While I was worried about short-term money issues, this fear was irrelevant as (a) I already had savings to last me for a while, and (b) if I ran out of money, I could easily return to work. I couldn’t see this until I visualized myself 1/3/5/10 years into the future. “No problem can be solved from the same level of consciousness that created it.” — Albert Einstein. To break out of your current problem, you need to adopt a different frame of mind — the mind of someone who has achieved your ideal goal. This brings us to the Ideal Vision Method. What is your ideal vision for this area of your life? For example, if you’re considering between two job options, what is your ideal vision for your career? If you’re considering whether to marry someone, what is your ideal vision in the area of romance? Which option brings you to your ideal vision? Let’s say like reader Joi, you have been married to your partner for 25 years. While you have lost all desire to be with him, you are afraid to file for divorce. Maybe you are afraid to be alone. Maybe you are afraid of social stigmas. Maybe you are afraid of the unknown, of dealing with legal fees, of going through the divorce process, of facing life as a divorcee. What is my ideal vision in the area of love? Which option brings me to my ideal vision? Perhaps your ideal vision is to be with someone who understands you, who loves you, and whom you want to spend the rest of your life with. Looking at your options, which option would bring you there? Option A: Stay with your partner but everything in the relationship remains status quo. This will not bring you to your vision as you have lost all desire to be with him. Option B: Divorce your partner. This may or may not bring you to your vision. If you divorce, you may remain single and not meet anyone suitable. On the other hand, you may meet someone new. Someone more compatible, whom you eventually remarry. Option C: Try one last time to work things out. Talk with your partner and tell him everything on your mind. Give him an ultimatum. Go for marriage counseling. As you can see, there is no clear-cut answer. A marriage involves another person, and we can never know how other people will behave or control their behavior. However, when you know your vision, you can take steps to nudge things toward your ideal scenario. You can tell your partner about this vision and get him on board. If your partner does not reciprocate your efforts even after 3 or 6 months of you trying, it would appear that Option B is the answer. Even if you do not know what the future will bring, at least there is a chance that you will meet someone more compatible. But if you stick with Options A and C, they are dead ends. You will never get to your ideal vision on these paths. The Ideal Vision Method helps because it takes you out of your situation. Instead of being boxed in by your limitations, you think about what you want. This helps you focus on your desires and figure out the path to get there, rather than focusing on the confines of the situation (which will give you more of the same). The last method is the Pros/Cons Analysis Method. This helps when you have a few options that are similar to (or very different from) each other, and you need to pick one. Here you assess each option and pick the one that matches your criteria the most. Identify your top few options for this dilemma. Do a detailed pros/cons analysis for each option. Identify your top 2-3 criteria. Pick the choice that fits these criteria the most. Let’s say you are thinking of migrating or at least getting a permanent residency somewhere. You are done with your home country and you wish to move on to other places. Because you are working in a highly-sought-after field, you have options around the world. This also gives you the paradox of choice, because you are not sure which is the best place to move to. What are the top few places I want to move to, where I have good career prospects? What are the pros/cons of each place? What are my top 2-3 objectives for my next home base? Which choice fits these objectives the most? From this process, you narrow down your considerations to a few places: US, UK, Australia, and New Zealand. Pros/cons of a country depend on individual preferences, but some considerations include costs of living, lifestyle, quality of healthcare, quality of education (if you have children), culture, and weather. As you do this analysis, you learn more about the criteria important to you. You decide that (a) quality of healthcare, (b) lifestyle, and (c) culture are the most important to you. You then pick the choice that best matches these criteria. It’s important to identify your top 2-3 criteria because many life options are never perfect. If perfection is your goal, you may never reach a decision. You need to get clear on your priorities, pick the best-fit option, and make the best out of it. The pros/cons analysis works well for evaluating job options too. If none of your choices fit your criteria, return to the drawing board and explore other options. Do this until you have a choice that matches your top 2-3 criteria. Putting these together, any of the three methods should give you an answer to your dilemma. Sometimes it’s possible that one method gives you a vague answer. If so, use the other two methods and the answer should unveil itself. If you use all three methods and get the same answer, then it’s a clear sign that this is the path to take. I haven’t had a situation where my answers conflict with each other. They usually point to the same direction. I don’t think it’s possible to get very conflicting answers because these methods are meant to lead you to your ideal life. Will this choice bring me closer to my ideal life? It should; otherwise, why are you contemplating it? Will it make me happy? Your choice should make you happy. If it makes you unhappy, then something is missing. Return to the drawing board to evaluate more options. If I don’t do this, will I regret it next time? A good choice shouldn’t cause regret. It’s better to do something to see how it turns out, rather than avoid it and wonder what could have been. At least with the first path, you know you did my best and you have no regrets. Sometimes, you may get an answer you don’t like. It’s possible that the choice isn’t something you want to take on right away. There are times when I get answers that I don’t like. However, it doesn’t change the fact that there is truth behind them. I’ve found that it’s when I stop running that I begin to solve my problems. Faulty thinking leads to faulty solutions. To solve our problems, we need to approach them from a different angle. The final thing I want to add is that when making life decisions, don’t make them based on your current circumstance. To do so would be to compromise your real wants. Rather, use the three methods to figure out what you really want, then find the way to get there. Your WHAT should come before your HOW, not the other way round. I hope you’ve found this article useful. 🙂 Whatever you decide is your decision to make. Decision making is never easy, but it’s when we make up our minds that we move forward in life. This article is about tackling life’s biggest dilemmas. For day-to-day decisions, read How to Stop Analysis Paralysis: 8 Important Tips.